I go into Sip My Ocean, the Pipilotti Rist retrospective at the Museum of Contemporary Art, expecting to encounter some ‘Big Time Sensuality’. This was the title of an earlier review of Rist’s work published in 2011 by The Guardian, and it struck me at the time as a direct reference to the Björk song of the same name – that wonderful ode to big, riotous, destabilising desire. Moving through the exhibition, I get the recurring feeling that what I am perceiving (movement, light and colour) cannot be easily contained, it spills beyond the edges of what I can grasp in my conscious thinking or fix into language. 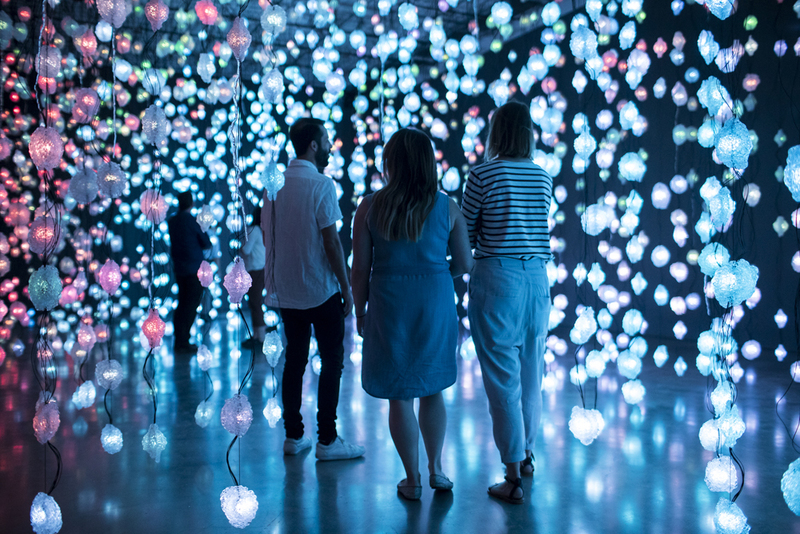 In ‘Pixelwald Motherboard’ (2016), a floor-to-ceiling forest of suspended lights that look like glowing, fist-sized hunks of ice, colour pulses through the environment in patterns that never cease to feel new. I sit on the floor deep inside the work, away from the sweltering heat of Circular Quay, and settle into a wide-open gaze (soft focus, active peripheral vision). A decentred intelligence would appear to be at work here: the lit-up forest has no singular mind, instead it feels more like a complex, unpredictable ecosystem with its strains of colour that shoal, trail, and occasionally thunder-crack through its veins. Many of Rist’s installations make me wonder how best to position myself, how best to move or think, in order to be swept up in their own movement or intelligence. With ‘Sleeping Pollen’ (2014), I enter a dim space and find myself surrounded by a collection of dark suspended orbs in varying sizes. Circular projections on the walls show us plants in close-up, starkly lit against their midnight backgrounds. Dappled light plays over the flats and edges of the gallery space, galaxy-like (or is it pollen-like? stars, pollen, same thing? ), and I start to pivot. As I turn I realise that everything around me – plants, constellations – are constantly turning, or expanding, or both. I turn and turn, at pace with the plants and refracted light, and at a certain point both my sense of balance and my separateness to the environment start to disintegrate: I’m listening acutely even as I feel as if I’m falling, being swallowed up by the streams of light. It’s a motion not entirely of my own making. ‘Sip My Ocean’ (1996), the title work of the exhibition, has a similar effect on me. Consisting of a mirror image projected across two adjoining walls, the meeting point (a corner) functions as a sort of luminous centre-seam. Here the strobe and rinse of the footage, which is all seaweed and hair and sunlight and teacups sinking in ocean shallows, pulls at my sense of up and down in a way I feel right down in my gut. In this same corner of the gallery I see ‘Ever Is Over All’ (1997). Alongside a delicious, trudging soundtrack, close-ups of deep orange flowers accompany video footage of Rist striding down an urban street, smashing in the windows of parked cars with an oversized, long-stemmed flower. A thought occurs to me suddenly: ‘this flower is so beautiful that I could smash a car window.’ I’ve been there before. So have a couple of friends of mine. The woman’s gesture makes total sense to me, and it’s the ‘Big Time Sensuality’ I’ve been anticipating. Another Björk track might even work well here, as a sort of caption or accompanying thought: ‘Violently Happy’ (1993) (‘come calm me down / before I get into trouble’). Although Rist has said that she puts herself in her videos as a means to explore human experience, and not feminine or female experience exclusively, her work matter-of-factly affirms a forceful, joyous, non-cis-het-male appetite for being in the world. I recall a Facebook invite to a music event I came across some months ago that featured a line-up of female-identifying and gender diverse artists, and proudly described itself as being by and for ‘grrrls’ who ‘can’t control their emotions’. I loved that, and in a sense this exhibition is a similar, unapologetic celebration of those capacities for feeling, a celebration that a patriarchal system would seek to frame as hysterical. The exhibition only takes up one floor of the Museum of Contemporary Art, but it is vast to the point that it resists overview or summary – all the more so because many of its components are time-based, offering opportunities for an ever deeper, longer engagement. Of what I did see, I can say this: that there were opportunities to get a little lost in my environment and to lose track of the time; that I found reflections on aesthetic experience and desire in relation to the personal and political; and that there was colour – generous, bottomless colour.